The diagram on the right shows the torque requirement of a typical ball valve under normal conditions. 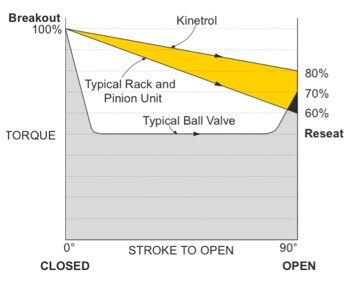 The typical torque output characteristics of Kinetrol and Rack and Pinion actuators, both sized to overcome the valve's breakout torque, are also illustrated. The diagram demonstrates that the Kinetrol actuator will exceed the torque requirement of the valve throughout the entire stroke while the rack and pinion unit will fail to re-seat the valve. The higher torque losses associated with the rack and pinion actuators (torque loss can be as high as 70%) dictate the selection of larger units to ensure complete re-seating. Spring units are available for either clockwise or counter clockwise spring action. looking at the unit from the end which interfaces with the actuator. The direction of actuator/spring assemblies are determined by looking at whole assembly from the non-output end. 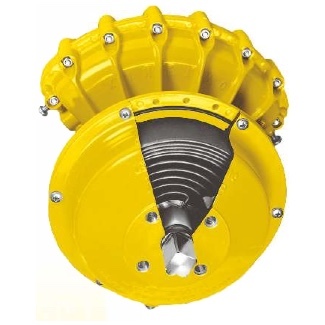 If high torque is required in one direction and lower torque in the other direction this can be set up easily by changing spring pretension to be higher or lower as required. Air stroke torque will always be double-acting torque (at air pressures available) less spring pretension torque. If air pressure available for actuator operation is less than 50psi (3.5 bar), 'balanced' torque output on air and spring strokes is still possible by using a spring return unit from a smaller actuator size. Listed below are factory assembled options of this kind. Factory assembled actuator/spring return assemblies have the spring pretension set for 'balanced' torque output when the actuator is operated by air at 80psi (5.5bar). Factory assemblies can be preset for different air pressures below 80psi (5.5 bar) on request. Spring return units supplied separate from actuators are also pre-tensioned for 80psi (5.5 bar) air operation unless otherwise stated. These are provided on all pretensioned spring return units supplied separate from actuators. They are also available as spare parts. Refer to TD121 for part numbers. A keeper plate must always be used to restrain spring tension whenever a spring unit case is removed from the actuator. Spring Casing: Models 02 to 07 pressure die-cast in ZL 16 zinc alloy. Models 08 to 30 in aluminium alloy. Epoxy stove enamel. Spring: Clock type spring steel. Mount Holes (output end): Same as matching actuator (except model 01), low pressure combinations & ISO drive versions.